It is September again and this time it’s San Francisco which witnessed the history once again. With a packed crowd the hall literally floated in air when iPhone 6 and iPhone 6 Plus were shown for the very first time to the attendees. Tuesday worked well for Apple as the number of attendees nearly doubled in the Flint Center for the Performing Arts, Cupertino where Steve Jobs rocked 30 years back when he gave the world Macintosh. News was roaring high as to when Apple will launch the phones in San Francisco. A new range of iPads, iPhone 6, iWatch, iPods or MP3 players were speculated among the options. As usual Apple worked a great deal in innovating something new and completely out of the box which has been the biggest strength of Apple in changing trends. “Today, we are pleased to announce the biggest advancement in iPhone.” this is what Tim Cook, CEO of Apple stated in the beginning. Tim cook, hosted the event in style and was hugely applauded by the attendees. iPhone 6 has a sleek, continuous seamless design with a beautiful body. As speculated, two versions of iPhone have been launched namely “iPhone 6” and “iPhone 6 Plus” which have been marked as the best iPhone ever made by Apple. The glass covers the sides to meet the anodized aluminum enclosure. It seemed that iPhone 6 slimmed down for this event specifically as it seemed very thin, probably the thinnest till now. The displays have full sRGB wide color gamut and the glass seems to be an ion-strengthened thing of beauty. To provide a wide view of things, Apple has equipped it with photo aligned IPS display. It is finally confirmed that iPhone 6 has a 4.7 inch display while iPhone 6 Plus has a 5.5 inch display. A resolution of 1334 by 750 is what new iPhone 6 Plus offers with a 1080p HD resolution. It supports a whooping 401 pixels per inch display. Meanwhile, iPhone 6 offers the same resolution with a 326ppi and 720p HD display. iPhone 6 is 6.9mm thick while iPhone 6 Plus is 7.1mm thick. The new landscape view for both the phones look out of the world where built in apps like messenger will look adorable and a better functionality will be availed. For the app lovers, Apple has put up nearly 1.3 million apps online. To power these beauties, A8 chipsets has been embedded into them which have up to 25% better processing power and 50% faster graphics. The graph shows that performance factor will be nearly 50 times better than the old iPhones! Wow, Apple has certainly killed the bugs well. Saving energy is what Apple has focused upon which can be relied from the fact that the new versions will be more than 50% energy efficient. Top game developers have confirmed that they will be delivering iPhone 6 games by the year end (Metal Titles). Once again just put your foot behind and think that “The iPhone 6 will perform and play better games than the next generation consoles”, Think about that for a second! iPhone 6 and Metal will certainly add a new chapter in the history of gaming. Apple has well equipped the new versions with M8 coprocessor which will measure data from compass, gyroscope, and accelerometer continuously. For fitness enthusiasts, barometer will be the thing as it can now tell if a person is going up the hills, mountains and everything in between. The new version now supports better voice band, clear and crisp sound can be heard on the other end now. iPhone 6 has over 200 LTE carriers around the world and has the highest number in this regard, so don’t worry about the connectivity now. Now, Apple iPhone 6 will support nearly 3 times faster Wi-Fi connectivity with 802.11ac addition. Forget about Skype and Viber, Wi-Fi calls can be made with iPhone 6 when calling conditions are poor. As always, Apple has hit hard on camera. With an 8MP iSight camera, 1.5u pixels, f/2.2 aperture; Apple has proved that there can be nothing better than this. Apple has gone the DSLR way by introducing the all new Focus Pixels which helps in focusing better in iPhone 6. Nobody should be lost in the crowd, so Apple has made it clear to detect faces that are far as well as near. Even if your hands are shaking, ISP will be your companion. Low light won’t be a problem now as optical image stabilization works wonders in low light. The burst mode detects smiles and blinks which ultimately detects the best picture. The new camera can capture videos a 120fps or 240fps and it has a high level of stabilization equipped within itself. Focus will change automatically even without getting caught on the screen. iPhone 6 has laid hard emphasis on “selfies” as new sensor focuses more light than ever before. It can click up to 10 pictures per second and an HDR photo when the moment is perfect. Now, one can add voice video and location in a single message. So, go ahead and tag everything in there. An intelligent keyboard, Health app, notification extension from favorite apps, Touch ID which helps to securely access data in other apps are some of the very few things which the all awaited iOS 8 has come up with. iPhone 6 will be available with six Silicon leather cases and five leather cases (also for iPhone 6 Plus). Both the iPhones will be available in gold, silver and grey scale. iPhone 6 Plus is priced at $299 for 16GB model, $399 for 64GB model and $499 for 128GB model with a two year contract while iPhone 6 will start at $199 for 16GB model, $299 for 64GB model and $399 for 128GB model also with a two year contract. It is one such feature which Apple will be promising on as it will fetch them a lot of money. It will be easier to pay with Apple Pay now which is an integration of great hardware and software. For using the services, the users will need to add a card from their iTunes account. In case you lose the phone, just use Find My iPhone to suspend payments. American Express, MasterCard, and Visa are the carriers with which Apple Pay will work with. Starting its services from US, this will be available worldwide very soon. iPhone 6 endorse a continuous flowing, seamless design with strikingly curved body. It is the slimmest iPhone ever as iPhone 6 is merely 6.9 mm thick and iPhone 6 Plus is just a smidge more at 7.1 mm. 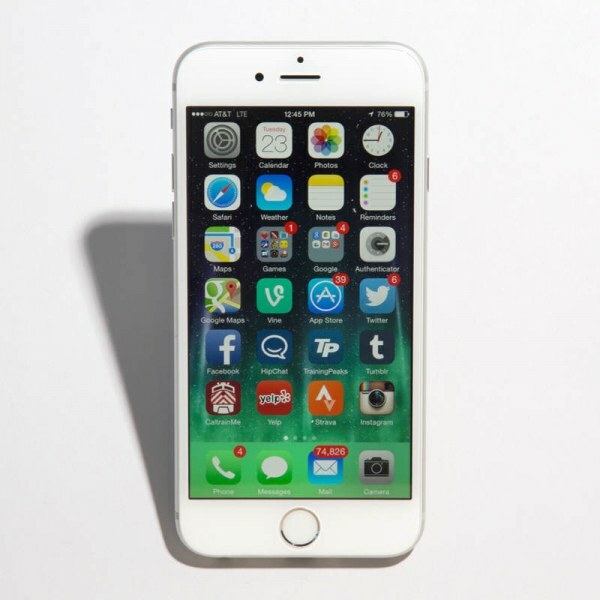 iPhone 6 is adorned with 4.7-inch display and iPhone 6 Plus have a 5.5-inch display in it. Both the devices have the latest, Retina HD Display enhanced with fully sRGB wide color gamut. Using a meticulous precision polishing process Apple succeeded in creating the flawless Ion-strength display. The immaculate iPhone 6 flashes its resolution of whooping 1334 by 750 with 326 pixels per inch of its display in over 1 million pixels in all. However, with the bigger screen, iPhone 6 Plus got the bigger screen resolution of 1920 by 1080 with 401 pixels per inch and over 2 million pixels in whole. Both iPhone 6 and iPhone Plus are powered by an A8 chip and a processor that is 50% faster than original Apple’s iPhone. With A8 chip and the most dynamic processor ever, iOS 8, iPhone 6 features 84 times faster graphics and even allow the over-intensive operations such as playing games at higher frame rates. iPhone 6 and iPhone 6 Plus are with 50% efficient energy life for sustained long-time use. The presence of Metal amplifies the performance of the iPhone 6 and iPhone Plus manifold. The new launch also rendered its users with 1.3 million Apps. Moreover, the Xcode is the centric operator of apps allowing the developers to handle the workings of iPhone 6. The Landscape view is another new feature added in the already perfect iPhone 6. The Health App is present to count and record al your health and physical activities, even the minute activities of counting the steps of stairs. iPhone 6 supports Barometer, it senses air pressure and measure relative elevation. This is another helpful feature for all the health conscious ones. The M8 coprocessor assists in measuring motion data of the compass, accelerometer and gyroscope. Faster LTE than any predecessor is enabled in iPhone 6. Voice over LTE provides crisp and clear voice than ever before. Wi-Fi calling is available when the cell condition is poor for making high quality calls. iPhone 6 is embellished with an 8MP iSight camera, 1.5µ pixels, ƒ/2.2 aperture and an all-new sensor. Focus Pixels for professional DSLR photography experience. FaceTime camera has ƒ/2.2 aperture, which provides 80% more light. Better face detection with front camera. iPhone 6 allows sending voice and videos and location with messages. iPhone 6 manufactured in environment friendly way. Apple Pay, a completely new way to pay securely without the fear of your personal accounts being exploited, enabled in iPhone 6 with the help of NFC antenna, and the safety of Touch ID in addition to the security and convenience of passbook and Secure Element. Both the phone will be made available from 19th September in most of the countries.